Meanwhile, in medium saucepan, combine spaghetti sauce and artichoke hearts. Cook over medium heat for 5 to 7 minutes or until thoroughly heated, stirring occasionally. To serve, spoon sauce over penne; sprinkle with cheese and parsley. 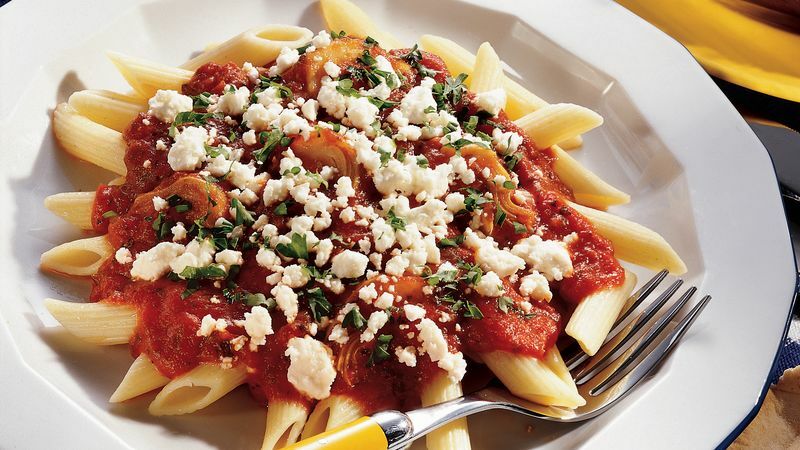 Feta is a classic Greek cheese traditionally made from sheep’s or goat’s milk. Commercial American manufacturers now make feta from cow’s milk. Feta has a mild flavor, but because it is cured and stored in a salty brine, it adds a tart and salty flavor to food. Use your favorite pasta shapes in place of the penne. Shapes differ in size and density, so be sure to cook the pasta you choose according to the package directions. Cantaloupe and honeydew melon wedges are a sweet contrast to this savory entrée. Garlic toast or warm pita bread complete the meal.